"That has led to a major increase in the number of collectors spreading out in areas where elk and deer are trying to find a little respite from winter. The last thing wildlife needs at this time of year are people speeding by on ATVs or snowmobiles, dogs running around off-leash and so on. It's a very serious problem." Each winter, as the snow begins to fall, elk and deer move down to their traditional winter range to search for what forage they can find. Towards the end of the season, forage becomes very scarce and the animals survive primarily on the fat stores they developed during summer and fall. As deer, elk and moose begin dropping their antlers in late winter, hundreds of collectors begin an intense, daily search for the freshest sheds - considered the most valuable - while the animals are still on their winter range and essentially starving. In a few egregious cases, witnesses have observed some shed collectors chasing a herd of elk or deer with an off-road vehicle in an attempt to secure a fresh shed dropped by a startled animal. "If wildlife is pressed once a day or every other day, we would not have as much concern," said de Vergie. "But these animals are constantly pressured now, often running from perceived threats dozens of times per day. People may not see it happen right away but severely stressed animals and their offspring will starve to death when their fat stores are depleted." Despite an initial focus on education last year, wildlife officers wrote several citations and seized numerous sheds from blatant violators, including trespass charges on people attempting to skirt the law by collecting sheds on private property without permission. CPW officers say they are ramping up enforcement in 2019. "We've done what we can to educate folks about the restrictions and why they are in place, including many face-to-face conversations," said de Vergie. "We hope that folks follow the rules and help us protect wildlife. If they don't, we will enforce our laws to the fullest extent." For each illegal shed, violators can expect a $50 fine plus an $18 surcharge. In addition, they will be assessed five points per shed against their hunting and fishing privileges. After 20 points, violators can lose their hunting and fishing privileges for up to five years. In addition, CPW officers will confiscate all illegally collected sheds. CPW officials remind everyone about a further restriction in Southwest Colorado in GMUs 54, 55, 66, 67, and 551 where the collection of shed antlers or horns is prohibited from Jan. 1 through May 15. In addition, collection and possession are prohibited in these GMUs between legal sunset and 10 a.m. from May 1 through May 15 each year. "We are not trying to keep people from collecting sheds," said de Vergie. "We are just asking collectors to wait a bit, cut wildlife a break, wait until the restricted periods end then go out and get your sheds." To report illegal wildlife activity, call your local CPW office. To remain anonymous, contact Operation Game Thief at 877-265-6648. Rewards are available if the information leads to an arrest or citation. For more information about shed collecting restrictions, visit the CPW website at https://cpw.state.co.us/antlershed. The CPW Commission approved the annual restrictions in 2018, implemented to protect wintering wildlife from severe and constant stress from human activity, primarily shed collectors. "Shed collecting has become extremely popular over the past decade because there is a significant potential for high profit," said Area Wildlife Manager Bill de Vergie of Meeker. Since Jan. 1, restrictions on collecting shed antlers have been in effect on all Colorado public lands west of Interstate 25, through April 30. Additional restrictions apply in the Gunnison Basin. 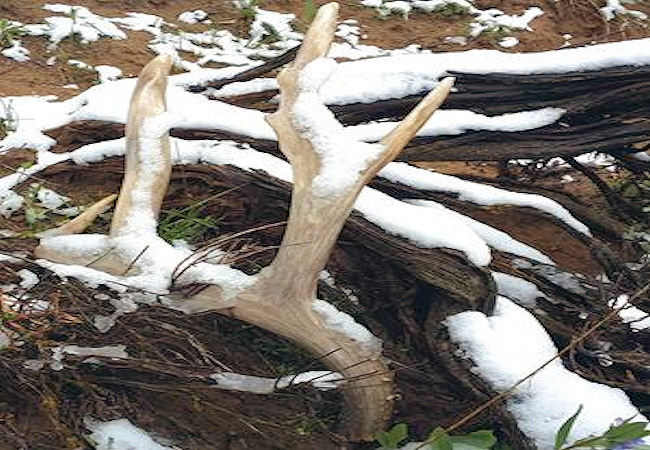 Colorado Parks and Wildlife officials say anyone caught in possession of or collecting sheds illegally during this time - including shed horns and antlers and horns naturally attached to a skull plate - will face fines if they ignore the law. The restrictions do not apply to private lands; however, CPW officials remind everyone trespassing laws are always in effect.